After you’ve been going the gym for over a year, you know all the basic moves. You’ve got the best form for the right lifts and your body feels like it’s growing all the time. But if you’ve been doing the same routine for a while, you might be noticing a decline in your progress. Unfortunately it happens to everyone, but it’s not a death sentence for your gains. You’ve just been using the same muscle fibers for the these lifts for so long, and now they’ve adapted, taking as little damage from each workout as possible. With minimal damage, there’s less need for recovery, and therefore slower growth and progress. Don’t get us wrong, slow progress is better than no progress – but you can do always do better, and we’re here to help you. 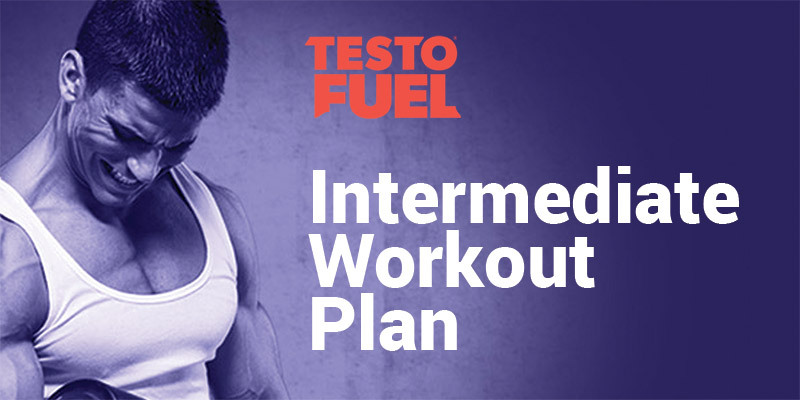 This is your next step: The TestoFuel Intermediate Workout Plan. Who is the Intermediate Workout Plan for? This exercise guide is for anyone who has been training for over a year and is looking to put a challenge back into their routine. With a three-day split of push, pull and lower body exercises, this workout provides you with the training you need to get back to growing at a much faster rate. There’s a combination of both compound and isolation work which will give you that balance of both strength and size. What’s more it works all the major muscle groups in your body, which is your best bet for skyrocketing testosterone levels, and recharging your progress. Should I be following this workout exactly? That’s entirely up to you. As this is only a week-long workout, you can run it for as many weeks as you like. We think you’re going to get the most benefit out of this workout if you use it for at least week – make a note of the exercises that you found to be the most challenging, and use them to freshen up your routine. This is also a good way to learn that there are effective exercises outside of your standard workout plan. If you’ve been doing the same thing for a while and it’s given you positive results in the past, it can be difficult to turn away from it. But don’t be afraid to try something new, working your muscles in alternative ways works different muscle fibers and keeps things interesting. What else is in the Intermediate Plan? Aside from the workout itself, you can find several useful training tips and workout boosts to make sure you get the most out of your sessions. For nutrition, there’s an example meal plan, and some need-to-know information when planning your diet, like not going overboard with protein, and how this can negatively influence your testosterone levels. Whereas the training tips provide you with some general approaches when it comes to your gym life, such as tips for dealing with plateaus and setting goals for yourself. And finally the workout boosts styles of lifting that you add directly to your workout to up the intensity. Drop sets, negative reps and more, all things you can add to your session to make it all the more challenging and beneficial. This is for the more experienced lifters. If you’ve been training for over a year and looking for something new, or to bust through a plateau, this is the workout you’ve been looking for. With rest day advice, nutrition tips and general workout suggestions its a great resource for gains. This is one a solid workout plan for anyone looking to pack on muscle and strength, after their current routine has started to become stale. This guide consists of a week split which works all the major muscle groups in your body and gives you that overall development and balanced growth. It’s also packed with additional help for nutrition, general gym advice and quick tips to intensify your workouts. If you’ve been training for over a year, and looking for the next step, this is it. Bust out of your plateau even faster! If you want to see results even faster when you’re training, naturally boosting your testosterone is your answer – and the best way to do that is with a testosterone booster. TestoFuel is a natural anabolic support complex which provides your body with the nutrients it needs to create the optimum hormone environment for the most effective muscle gain and recovery from your training. If you’re eating right and training hard, this is one of the best tools to have in your supplement stack to take you to the next level.